Derek B. Gayle reviews the May 3 episode of NBC's Community. Picking up after last week’s shocker, we delve into the Greendale 7’s response to death, resulting in one of the worst “wake riots” Greendale’s district has ever seen. With all the continuity nods and epic plot threads, this sounds like it would be great on paper, right? Troy, Abed and Annie are watching Starburns’s video will, where he leaves Abed the task of making a video tribute of his life. Starburns also leaves Abed his ashes (and the ashes of his lizard), which makes Troy very uncomfortable. In the study group, Annie suggests they talk about it. Jeff is upfront about the concept of death and finds it worthless to dwell on it, while Troy clearly isn’t dealing with it well. Britta offers her psych major services, which involves putting stars on her face and having them ask her questions they’d ask him. Of course, it doesn’t go well, as they either ask about heaven or really random unemotional things, frustrating Britta. She continues her exercises which everyone hates, but Annie suggests in place of grief counseling they host a memorial. 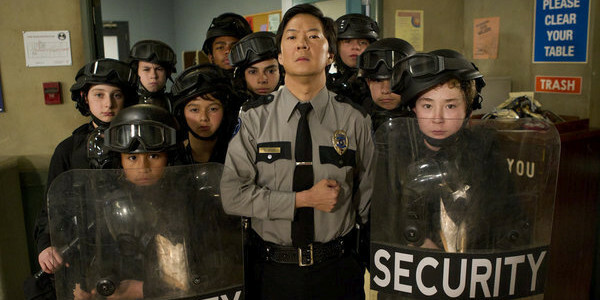 Meanwhile, angered by Starburns’s death by stolen Greendale lab equipment, Chang offers Dean a crayon-drawn contract for new security laws, including the ability to enact martial law, use pepper spray, have involuntary cavity searches and ban all soft serve, which Dean of course turns down. Dean then delivers the group bad news: Professor Kane has resigned, and the Biology class has been cancelled. This means everyone will have an Incomplete grade and need to complete the class over the summer, causing Jeff to completely break down. Dean confronts the study group, saying Subway is threatening to pull out of Greendale and the School Board is having a hearing to investigate the “ringleaders”—the Greendale 7. Jeff, feeling guilty, concedes that they are bad students (though Dean is still not a good Dean either) and Britta suggests they blame it on grief to save everyone’s butts. Pierce also suggests Chang be the scapegoat, considering he “commanded a bunch of pre-teens to spray poison on [their] faces.” Chang catches wind of this, and he tranqs Dean and replaces him with the Faux-by (J.P. Manoux) he discovered in “Contemporary Impressionists.” At the Board meeting, Jeff tries to convince them the riot happened because everyone was grieving and it was Chang’s fault—only for Chang to walk in, acting eerily normal, and sweet-talking/bribing the board. Faux-Dean pops in to give his approval of blaming the Greendale 7, and the Board decides to expel them all. Back at Troy/Abed/Annie’s apartment, the group laments the day’s events. Abed wonders what would have happened if Jeff rolled the dice in “Remedial Chaos Theory,” and if this, perhaps, is the darkest timeline. Troy breaks out of the funk, realizing that they’re all alive and fine, and Abed agrees—things are bad, but they’re all together, so this is the perfect timeline. They have a few drinks and pizza, and enjoy themselves. As much as it pains me to say this after the string of absolutely wonderful, near-perfect episodes, this just didn’t hit the right chords. “Course Listing Unavailable” has a lot going for it in concept—dealing with death, tying together ongoing plots, and shaking up the status quo—but it doesn’t balance these big ideas with enough laughs or emotion. “Virtual Systems Analysis” got away with not being terribly funny because it was so insightful and heartfelt, while “Basic Lupine Urology” overcame its lack of heart by being extremely clever and hilarious. Here, it feels like The Powers That Be tried hard to make this a daring episode plot-wise, without really making it all that interesting beyond the concept. It was off to a good start, thanks to the (abnormally short) teaser and some fun as group dealt with the very idea of death. But then we transition to Wake Riot and our big developments—which again, sound great on paper—and overall, it just doesn’t click. What happens is more or less what you’d expect, but without too many really clever jokes or character moments thrown in. Sure, we get the sweet moments in the final scene (I’ll get to that) but for an episode so packed with stuff, it felt kind of empty. Part of the issue is that the pacing didn’t really fit the content. A ton of plot happened in this episode, very big things at that, but somehow it never really felt like it. It’s worth noting that we only get an A-plot, with no subplots whatsoever. On the surface that could be an advantage, but here each scene just felt like it went on for very, very long. Again, that wouldn’t be a bad thing if it was meant to be a slower episode, but so much stuff was going on that this doesn’t quite match what became very fast-paced developments. The slower pace could have worked had the episode perhaps explored each character’s ideas and views of death (surely we’d hear more from Pierce after his lava lamp mom ordeal last year!) but that stopped to a halt at the wake, of all things. The pacing could be an editing or a directing issue, but considering this was directed by Tristram Shapeero, who’s turned in episodes as strong as “Virtual Systems Analysis” and “Pillows and Blankets,” it’s surprising. This was, however, Tim Saccardo’s first solo writing effort (he’s been a script coordinator for the rest of the show) and, though I respect he was tackling some big things, it wasn’t a very strong script, at least by Community‘s standards. 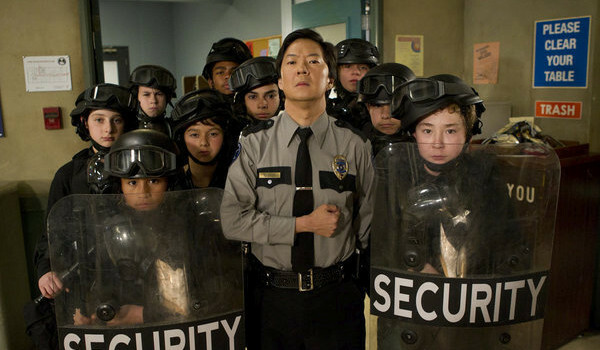 Ken Jeong also got substantially more to do. Chang will probably never have the appeal he had back in season one, but it was fun seeing him toned down a bit to a more devious villain instead of just being totally crazy. Well, except for that extremely creepy (and hilarious) face he made during Jeff’s speech in the board meeting about him. Chang’s been lurking in the shadows all season, and it seems now that he’s executing some strange master plan; he’s looking more like this season’s Big Bad, at least for this arc. It’s interesting to see him getting back to his more sinister side, after having devolved into a relatively harmless buffoon back in season 2. One of the most notable parts of the episode is the fact that, ignoring the Dean switcheroo, it could have functioned as a somewhat dark season/series finale. Thankfully it’s neither, but it did still have a strange finality to it, without so much as a cliffhanger for next week. This might be part of what felt a little off; it’s hard to figure out exactly what the show was trying to do here. The “Remedial Chaos Theory” references, for example, felt oddly shoehorned in. It was cute at first, but then it kept going, such as having Britta meeting the pizza guy again. The mini-speech that resulted from Troy was fine, but the build-up to it was odd. Actually, it felt like when a series gets wind of cancellation and rushes an extra scene to cap off an unintended finale; we got this quick “everything is okay, we’ll all be okay and go off for new adventures!” and a reference to one of the show’s finest moments. None of this was bad—I’m all for continuity—it was just weird and not as adeptly integrated as it could have been. However, this could be justified if next week picks up with referencing it being “after the end.” Or perhaps this whole “expelled” arc will lead to the Greendale 7 accepting their love of Greendale as a whole instead of just their own group. But again, that all depends on where next week goes. That being said, the quick, heartfelt moments in the apartment scene were really sweet. The group is at its funniest when everyone is bickering and screaming, but the truly great parts of the show are when they’re just having fun. And whatever your stances on ‘ships are, at least the moments we get are always adorable and not heavy-handed, as we see from the brief Jeff/Annie and Troy/Britta moments. I especially have to commend Gillian Jacobs on her distinct, soft expression that only comes up during those moments with Troy. It’s subtle, but effective. If anything, though, I certainly respect the show’s willingness to really shake-up the status quo and pull out something different, even as a show famous for being different. It’s not at all a bad episode, thanks to the developing plots, but on that (admittedly high) Community curve, it sort of falls middle-of-the-road in terms of its humor, heart and execution. Chances are good we’ll see some great stuff happen because of this episode’s events, but in its own bubble, it doesn’t really meet expectations. Tag: Starburns’s fantastic tribute video. Professor Kane resigned…so was last week the last we’ve seen of Michael K. Williams? Technically, Britta didn’t directly do anything to incite the riot like the rest of the Greendale 7, from what we saw. Guess the Board Britta’d that? Troy calling his penpal and the way Annie whispers “dying” (like so many people actually do) are why I really wish more of this episode could have delved into their thoughts on death. I always thought J.P. Manoux (Smallville fans would know him as Edgar from “Transference”) had an eerie resemblance to Jim Rash. So it’s great he’s being utilized beyond the one cameo. There are too many good Dean moments to mention here (touching Jeff’s stomach! The group hug!) but all of them are great. Also, the Dalmatian paraphernalia on his desk is always a nice touch. Freezefame moments: Abed’s reaction to Britta being Starburns, and Pierce’s face during Garrett singing. “You seemed smarter than me when I met you.” – One of the best self-references the show has ever made.